San Diego students have been invited to attend oral argument and ask questions of the justices and attorneys during a special session Dec. 3. 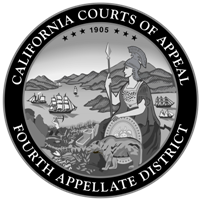 SAN DIEGO—Administrative Presiding Justice Judith McConnell has announced that the Court of Appeal, Fourth Appellate District, Division One will hold a special oral argument session as part of its educational outreach program on Dec. 3. Open to the public, the session will begin at 10 a.m. in the Auditorium of E3 Civics High School, located at 395 11th Avenue, San Diego, CA 92101. This outreach program is one of many in the Fourth Appellate District to expand students’ understanding of the appellate court process. The students will watch experienced attorneys argue their cases and respond to inquiries before the court. After oral argument concludes, the justices and counsel will discuss the appellate process with students and will answer questions. This program is the result of a collaborative effort between E3 Civics High School, Lincoln High School, Crawford High School and the Court of Appeal, Fourth Appellate District, Division One. For more information, contact Mr. Kevin J. Lane, Clerk/Executive Officer of the Court of Appeal, at 619-744-0760.